Reaction to the official announcement of USF1 yesterday has varied from complete skepticism to enthusiastic (if cautious) welcoming of the news. Generally, the most supportive comments have come from American sources and one can sense the need of Stateside fans to see their country once again involved in the sport. Conversely, many of the strongest doubts that anything will ever come of the project have an undercurrent of anti-Americanism. Some people will always be eager to rubbish anything from the US of A, as though driven by feelings of inferiority. This subject of nationalism has also been cited as one of the possible drawbacks to the USF1 concept, presumably because of the stated intention to employ American drivers. Yet this is little more than Force India's intent to bring Indian drivers into the sport as soon as they are ready. Vijay Mallya will have to spend a few years building up a talent pool of racers in India before he can achieve his dream but the States already has a huge racing fraternity; the talent is there and it is only a matter of finding it. It is pretty obvious that the decision to put American drivers in the cars is driven less by nationalism than the desire to bring the States back into F1 and to encourage Americans to take a look at the sport. Since USF1's strategy depends heavily on extending and serving the US fanbase, it makes sense to have drivers who are known to the American public. That was the major impression given by SpeedTV's coverage of the announcement - that Peter Windsor and Ken Anderson have devised a new means to enter F1 that may well become the norm in the future. Their strategy may not be effective (time will tell) but F1 had better hope that it succeeds. Toyota and Honda have demonstrated that it is not enough to throw huge amounts of money at a team for it to win GPs; McLaren and Ferrari may now be spending multi-millions to stay in front but even they are being forced to cut back on expenditure. If USF1 can show that it is not necessary to invest hundreds of millions of dollars to be at least respectable in F1, the others will follow. I see no point in rubbishing the project as some are doing - it is not as if the team is unaware of the difficulties confronting it. Guarded optimism seems the most sensible stance at the moment and any reiteration of the pitfalls awaiting is curmudgeonly at best. Note that American fans (as exemplified by today's special podcast from Formula 1 blog) are cautious in their hopes for the team; they know the obstacles confronting any attempt to enter F1 but are prepared to support rather than criticize. Personally, I am glad when any new team decides to have a go at F1. The sport needs diversity and every team was once a beginner. Have we forgotten so soon how Eddie Jordan came in and embarrassed the big teams in a very short time? That can happen again - in fact, it must or we will be left with a two- or three-team sport. And, if USF1 can achieve any success at all, it will give me great delight to crow at the doubters of today. I am with Todd and Grace on this one - come on, Peter and Ken, sell us the T-shirts and caps and we'll wear 'em! I think it is great that after all the time since JYS did it that someone else intends to build an F1 team form the ground up. I hope USF1 makes it on to the grid for 2010 and is at least reasonably competitive. I also hope they don't hamstring themselves by sticking to rigidly to all American thing. They need to get the best people they can not the best within certain restrictions. I would love to see Barrichello on the grid again, but it would be a shame if he were to end up as a back marker again only to be kicked to the curb when the team starts to succeed. I will wear the hat and T-shirt. Barrichello would probably be happy just to have a drive again - he never wanted to retire anyway. And I dare say he'd cope with just another year or two before stepping down of his own volition. Like DC, he wants to race until the passion has gone. The team now has less than 14 months to lease a facility, hire at least 30-50 engineers and an experienced technical director, design a car from the ground up, build what they can and form contracts with suppliers to build the rest, put the car together and finally get as much testing (for shakedown, if not performance) in as they can before they come under FIA rules. This is a tight schedule, especially with every part of the process being totally new to every single team member, save Ken and Peter, unless they plan to hire experienced europeans. Toyota announced they would be running in January of 1999 and didn't compete until 2002. I hope USF1 keep their promise to make the team accessible, because this should be exciting to watch and hopefully some interesting new designs will come out of a team making a fresh reading of the rulebook. It seems like such good news that the US is entering F1, and since we are dreaming of scenarios where Scott Speed and Rubens Barrichello get rides again, let' dream big. Maybe they could persuade Porsche to supply engine/drivetrain components. Porsche has made it pretty clear they are more interested in backing independent teams in other motor sports events. Why not F1 as well? The US team doesn't have any compelling choices for suppliers so maybe they could use Gurny's influence. It would be a rather elegant re-entry for Porsche. marc, as far as I can tell the teams must choose from amongst the frozen engines which are already competing or from Cosworth, who won Max's call for a standard engine supplier. Toyota has no reason to try to prove it can make the most powerful engines in the US market and Ferrari sells cars as fast as they can make them, so they dont need the marketing. I think BMW and Mercedes both have a point to make in America about who has the most advanced technology. They will both see this as an inexpensive way to market their technological prowess in their biggest market. Nick: No one is denying that the team has a mountain to climb in the coming year but Ken and Peter must know that too. They have spent four years preparing for this and must have answers to our doubts or they would just be setting themselves up for a monumental fall. I suspect that they are already much further advanced along the premises and personnel path than they admitted - they will have talked to a lot of people already (and at least one has been convinced and provided the working capital). So the big question is: can they build a reasonably effective car in time? Existing teams do this every year so it is certainly possible; USF1's task is greater in that they are starting from scratch but it has been done before and they will have people with at least related experience. i would say that they can build a car in the timeframe although how competitive it is remains to be seen. The most likely engine supplier could well be BMW. Mercedes is already supplying Force India, Ferrari powers Toro Rosso, Renault Red Bull and Toyota Williams, so only BMW is left out of the game. They have supplied engines in the past so it would be nothing new to them and, with their increasing ability to fight the big two, I doubt they would fear being beaten by a customer team. Plus the company is big in America and needs to keep that market sweet. Toyota's long preparation period before entering F1 is the exception rather than the rule - and typical of the company. They have always tried to use well-tested technology rather than the latest thing and this has been very evident in their strategy in the sport. They don't like taking chances. Other teams have been set up in a year only and some of them have been surprisingly competitive very early on (Stewart, Jordan). What can make the difference is innovative thinking on and solutions to well known problems. That is the essence of what USF1 is trying to do - invent a new way to enter the game. We should not be surprised that the plan looks so different from the usual start-up therefore. It has to be if it is going to work at all. The biggest and most frequently-mentioned problem is funding, of course. I have read innumerable comments (Paul Stoddart chimed in today) pointing at the lack of a major sponsor and declaring it impossible to find one in the present economic climate. Obviously, these detractors did not listen to the official announcement - it is precisely because major sponsors are so rare now that the team has devised an alternative means of funding by small investors, particularly service industries to motor sport. If you cannot get one guy to give you $100 million, why not get $5 million each from twenty partners in the building of the car? The strategy may not work but it represents fresh thinking on the matter of funding and, before we suggest that the team is doomed, we ought to give them time to prove it one way or another. I think the chances are good that they will be on the grid for 2010. It would appear that the USF1 team concept and structure has been fully researched and reasonably (we hope) well thought out. I think it's incumbent on US F1 fans...in fact all F1 fans...to give the team their support and good wishes. A US-based team in F1 is a good thing for all concerned. Plus, I think it will go a long way in helping to justify the return of the US and Canadian GP's...and that's a really, really good thing. Hear, hear, Don. At the very least, I think all F1 fans should allow the team the space to try. Pointing out the obvious difficulties does nothing to help the project - and it is the most important experiment in the F1 arena for years. Weather USF1 succeeds or not, just their attempting is a good thing. If they succeed, they may pave a path for others. If they fail we will know Ecclestone and Mosley's ploy to cut costs has failed and they have more work to do toward making F1 accessible to privateers. I think their timing is great. 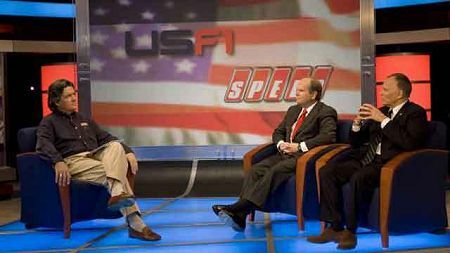 I think a great many fringe fans would love to see the USA reported to be doing something well in the worlds media. To join the F1 circus is a beginning of a bit of positive public relations. Weather they win or lose at least they are involved with the other kids on the playground. For those who love to hate, it'll take some of the weight off Ferrari as a side effect. On the other side it is interesting to perceive a US team being "the little guy." With the US auto industry where it is these days, USF1 might be able to restore a bit of shine to what once was a given to most Americans. Let's hope it works. Diversity is beneficial to all of us. this is why i keep coming back to the comments a day later! i admit to being one of those hippy dippys who think rabid nationalism is the bane of humanity so, honestly i couldn't give a toss if there is or isn't a single star or stripe in f1....BUT you just lit my little eyeballs up with that last comment. I may not live to see it happen but apparently I can still hope that irl mutates into something that keeps me home on sundays and doesn't put me to sleep! go team america, usf1!